In America, there continues to be a series of robberies, home invasions and break-ins that occur everyday to households all across the nation. Despite the high number of crime that takes place, homeowners still continue to carry on with their lives as if they are not worried about the possibility of a crime happening to their home. In fact, based on Alarms.org, statistics show that there are about 2.5 million burglaries that may occur on average in the United States and about more than 66 percent of these burglaries that happen are home break-ins. Shockingly, authorities are only able to solve an average of about 13 percent of the break-ins because of not having enough witnesses or having any proper evidence to find the criminal responsible. This means that there are many homes that are left with nothing. When a burglary occurs, it is most often that they end up taking everything and anything of value, even items that may have some sentimental value to the homeowner. The best thing to do to prevent a burglary from happening to your household is to bump up your security and strengthen your doors and garage door. Consider replacing your garage door with a locking steel garage door. According to Safewise, statistics show that there are about on average 34 percent of burglaries that take place, where the criminal decides to enter a home through the front of the home, by the front door and even the garage door. There are also about more than 30 percent of criminals who decide to climb through an unlocked window or door around the home. Keeping your home secure is critical the outcome of your home. You never want to leave your home defenseless. Having a security system is the smart thing to do, so that you can be able to have eyes around your home at all times. But, the other most important thing you can do as a homeowner is to make your home more secure. Your garage door is one of the easiest ways a criminal can get in to your home. With having a poor condition garage door, you could be possibly allowing them to come right in. 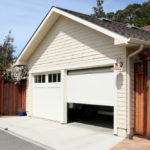 If you garage door is very weak and can use some repairs to strengthen it, you may want to consider having your garage door completely replaced. Fortunately, there have been newer model garage doors that allow homeowners to maintain more safety and security for their home. There are steel garage doors that are able to have locking capabilities built in to help you keep your home safer. Because these garage doors are made from heavy duty quality steel material, there is no way that any criminal can access your home from your garage doors. Take time to conduct some research online to find me your nearest new garage doors herriman ut contractor. The safety and security of your home should be your number one main goal. If you are looking to bump up your security level for your home, then consider replacing your garage door for the top notch secure heavy metal doors. Being proactive can prevent your home from being next on a criminal’s itinerary.